I just wanted to say a big THANK YOU to everyone who helped with the Seed & Spark crowd funding campaign set up to help promote and raise funding for Dan Thornton’s documentary film project about my work. 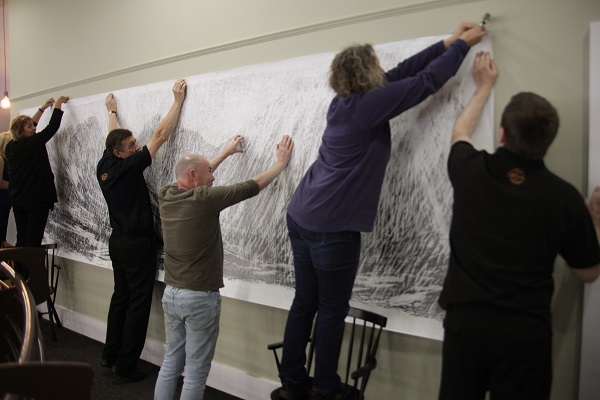 Dan Thornton and Cindy Apple have been over in Scotland for the last week and on Tuesday we travelled over to the Isle of Arran Distillery with them to film the final footage for the documentary ….the big Glen Rosa drawing being exhibited on the island for the first time. We had a great day and with the help of Rhona Arthur and Marie Blackwood from North Ayrshire Council and Kate and her staff at the distillery, we managed to hang this large drawing without any problems. Many thanks to everyone who offered their hands in this tricky operation! Much appreciated. We also hung five other paintings alongside the big drawing and I have to say I was very pleased with the final result. The work will be on display at the Isle of Arran Distillery Visitor Centre in Lochranza until October 31st 2015. Do pop along to see the work and enjoy this fantastic distillery if you’re on the island in the next couple of months. 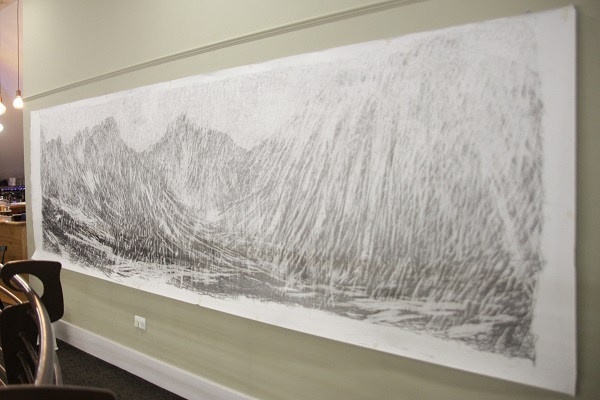 Prints of the big drawing can be purchased at the visitor centre shop along with a selection of my gift cards. Dan and Cindy fly back to Seattle on Monday and the next stage of this big project will be to raise the funds to complete the editing work and turn the hours and hours of footage Dan and Cindy have taken, into a finished documentary. Have a good journey back tomorrow Dan and Cindy and my thanks to you both for all the hard work you put into the project ….and for all your patience too! For more information about this Isle of Arran Distillery link. Photos courtesy of Dan Thornton and Cindy Apple.